Located in the central Gifu Prefecture, not very far from Tokyo or Kyoto, a beautiful example of traditional Japanese architecture survives in the villages of Shirakawa-go and Gokayama. Some of the existing houses were built over 300 years ago and have been beautifully preserved by each successive generation of residents. The 'gassho-style' houses, as they are known, are rare examples of their kind, even in Japan. The villages stretch along the Sho River, in a mountainous region, remote and isolated. Access to the area was difficult for a long period of time, which has contributed to its preservation throughout the ages. These villages, with their Gassho-style houses, thrived on the cultivation of mulberry trees and the rearing of - silkworm. "The oldest traces of human life in Shirakawa-go are artifacts dating back to between 7000 BC and 2300 BC. Multiple pieces of pottery have been excavated, painting a picture of an independent Hida (sic. region) interacting with the surrounding areas. Also excavated are a mirror dating from around 600 AD, documents from 700 AD have been found that appear to mention Shirakawa-go, although it is not certain. The name “Shirakawa-go” first appears clearly in history in around 1176. The name is thought to have been in wide use at this time as it appeared written in the diary of an aristocrat living in Kyoto". Gassho-zukuri is a house built of wooden beams combined to form a steep thatched roof that resembles two hands together in praying position. The larger houses in the village, with their steeply pitched thatched roofs, are the only examples of their kind in Japan. Japanese thatched roofs typically use a gambrel or hipped roof design, supported by an internal wooden frame. However, the gassho style design is different, featuring gabled roofs with long, individual, beams defining and supporting the roofline. This design creates a large space which allows both breeze and light to enter and travel in the space, contributing to making it an ideal environment for the breeding of silkworm. Even with economic fluctuations, this village remains an example of a traditional way of life in which people adapted to their changing surrounding environment as well as the economic circumstances. Because the village is located in one of the few regions of Japan with heavy snowfall in the winter, these types of homes were purposely created in order to endure the inclement weather. "In order to make it easier to clear off the snow, the thatched roofs of Shirakawago’s over 100 ancient wooden dwellings have been built at an approximately 60 degrees angle", describes Tokiotours. This is an example of a human settlement and living structure which was forced to adapt to its environment. The Ogimachi village is the largest, with almost 150 gassho-zukuri style houses still used as homes and stores. Some of the buildings are over 250 years old. The houses have been continuously preserved by each successive generation of residents. They were built with three or four stories to be large enough to house extended families on the first floor and allow silkworm farming in the rest of the house. 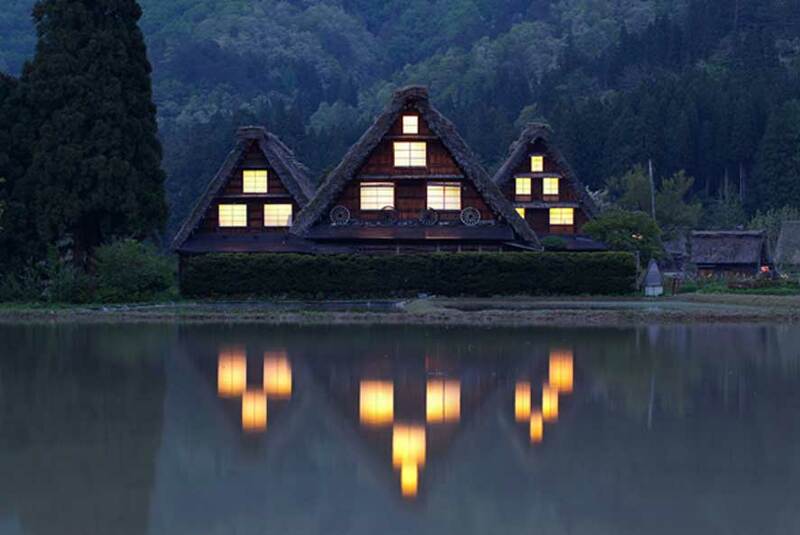 "The structure is built to suit the environment in Shirakawa. It is made to withstand heavy snowfall. The houses face north and south, to minimize wind resistance. They are also built for comfort in both summer and winter. The houses stand in a certain direction to adjust the amount of sun in order to keep the room cool in the summer and warm in the winter". The gassho-style houses caught the attention of German minimalist architect Bruno Taut (1880 – 1938). There is some speculation that his writings about the gassho style was the motivation behind his book “The Re-discovery of Japanese Beauty”.